Maybe it’s the fact that living with 2 cats and 2 – 4 dogs for the last 10 years is just plain hard on a house. Maybe it’s that I’m terrified of trimming their nails after I cut my kitten’s quick 11 years ago, and it bled a little, and he looked up at me and said peep and I felt like the worst person in the world for betraying the trust of a tiny helpless animal, and now I just have the vet trim their nails, but it’s not often enough. So maybe I have very good animals, and I am a very bad animal parent. At any rate, my furniture is destroyed. It passed the point this year where I could have people over, and Thanksgiving is coming up fast. I’ve hosted Thanksgiving ever since I came to the decision I could no longer try to go have dinner at my mom’s, my dad’s, Justin’s mom’s, Justin’s dad’s every year, but there was also no way to pick just one place and tell the others sorry. Now they all come to me. But I can’t make them sit on these couches. The cats have finally done them in. I sort of thought my oldest cat, the one with the enlarged heart and a fondness for the arms of sofas, would sort of, you know, leave this world soon? I was waiting some such event to fix the couches, but he won the waiting game, and something had to be done. I looked for replacements including a new version of what I already had, but they stopped making it, but the store recommended their upholstery guy just fix what I had. So I had Juanito’s Fine Furniture come and bid and Juan was super nice and said he’d get it done by Thanksgiving (fingers crossed!) and the bid is way less expensive than buying new, and all of this led me to one of my puzzlingly favorite things to do: fabric shopping. I hardly ever do anything with the fabric I buy, I just store it and look at it, so I’ve been grounded from the fabric stores for a while, but this time it had to be done. 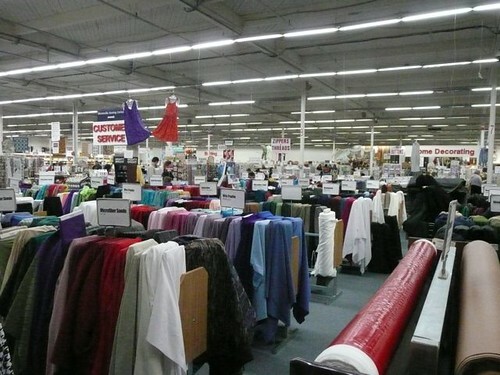 Out in an especially charmless stretch of road, by car dealerships and strip clubs, there’s a huge fabric store warehouse, Fabric Depot, home of the nearly constant 40% off sale. There was a limo outside on this particular trip. 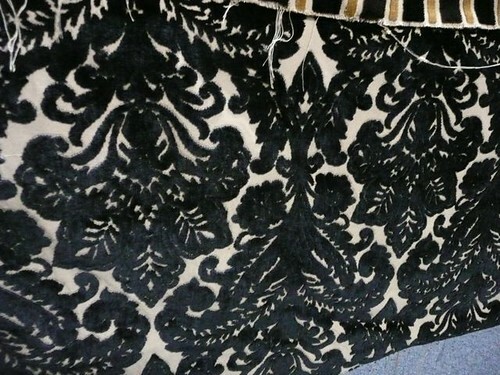 Do you think someone really takes a limo to Fabric Depot, or was it waiting for someone at the establishment across the street? The store is a huge warehousey building with frumpy dresses hanging from the ceiling on display. It’s a place that reminds me of one of my all time favorite quotes from my brother, who once said of an old rug in the hallway, “looking at that makes me feel poor.” I’m not sure why, but once I start looking around, that doesn’t really matter to me. I start wanting everything. 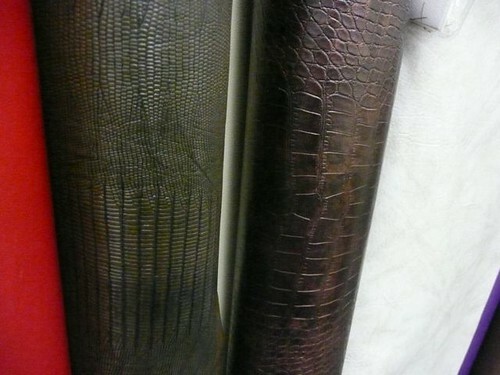 I love the stuff I don’t need but I imagine I might need, like this fake snakeskin might be good on an ottoman with a chrome base, which only exists in my imagination. 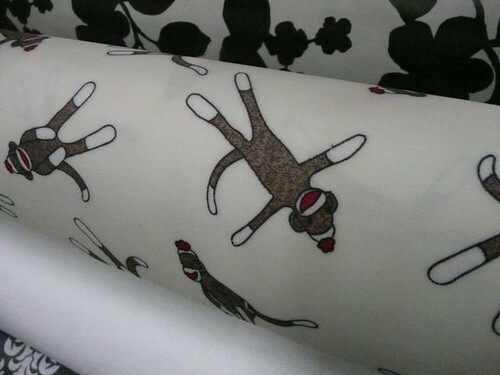 What possible use could I have for sock monkey oil cloth? Do I have whimsical style in home decor? No. Do I have children who might like it as a picnic table cover? No. Do I have a picnic table? Do I even like picnics? No and no. 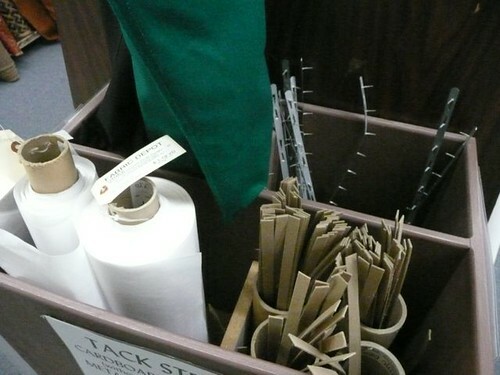 But something makes me want the stupid stuff. But I resisted. 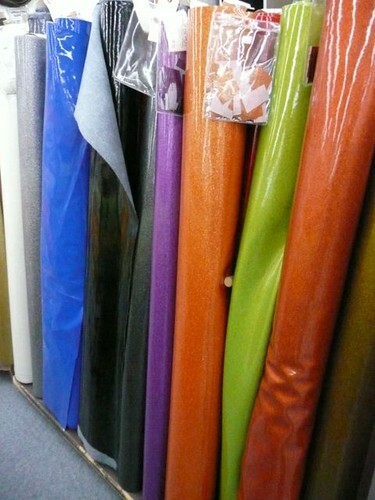 One of the things I like about fabric stores is that there are usually things that are sparkly. I LOVE things that are sparkly. Diner looking sparkle vinyl? Sure. Sometimes I do minor upholstery myself, but I don’t really know what I’m doing. It’s just me with a staple gun and some fabric, doing what I can, but there are all these bits and bobs that look like, if only I had those, I could recover anything! 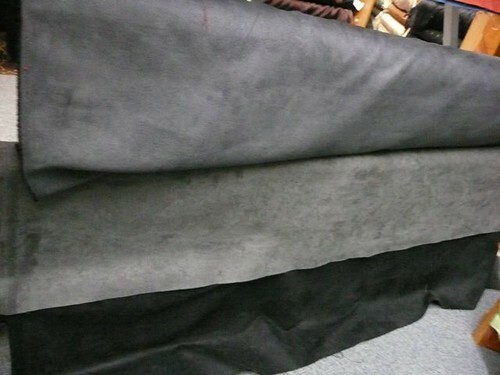 In the end, I got what I came for, some neutral colored ultrasuedes to recover two sofas, since that’s the fabric that stands up to animals the best, that I can wipe off if a dog throws up, that I can take outside and hose down if necessary, and that tolerates cat abuse the longest. I pretty much got out of there with only what I planned and needed. I also got 14 yards of curtain lining, which I am SURE I’m going to use to insulate the curtains before winter. I’ve already started measuring and cutting, so halfway there. Just need to make myself sit down at the sewing machine to finish up. 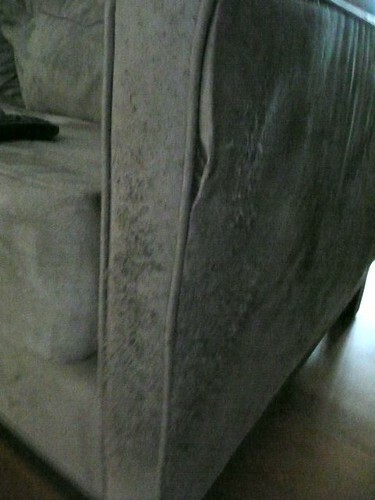 Oddly enough of the seven cats I’ve had over the years only one has ever scratched the furniture. I do have a scratching post which some have used but they seem to do most of their damage to trees and wooden posts outside.Just lucky I guess! Karen – make no mistake, I have no knowledge and rarely finish projects. I’m more a buy and store person too. But yes, a class might help someday. easygardener – Aha! I knew my own cat was just plain bad. nonlineargirl – Is that the Mill End store? That one is gross, but I could get lost in there for hours anyway. I hate picnics too. You’re all uncomfortable, there’s no chairs or table to eat at and your food always ends up getting hot from the sun. Stupid. This was a fun post. 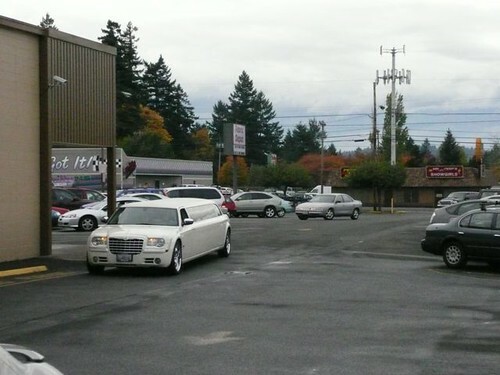 I love your sense of humor…the limo outside the fabric shop! and all the fun offerings inside…Stores like this are like when I look ap in an dictionary for a word and I keep on getting sidetracked on all the other words in there!We have an 8 month old Siamese cat she is 8 months old. Her name is Isis and she has peronality plus! I guess we should trim the nails? I will see about that when we go to the vet. you said that is what you do? Looks like I need a dictionary with all my typos! Chris – Right? Not to mention the bees and flies. I am angry at people who make me eat outdoors! Phillip – Thank you for the kind words. If I were you, I would try to trim her nails at home, if she’ll put up with it, that’s much easier and cheaper. However, I am a hypocrite, because I can’t bring myself to do it. 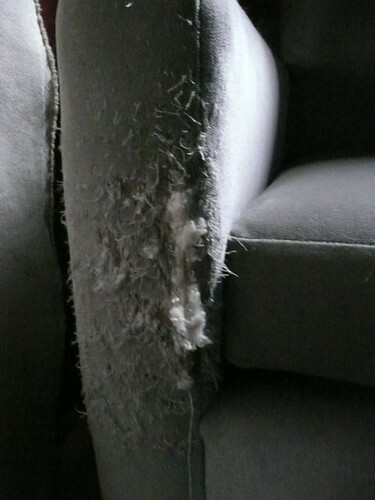 Your cat might not scratch furniture, some don’t. I have the bad animal luck.